Plants epiphytic, with prominent pseudobulbs, base covered by sheathing bracts, to 50 cm (exclusive of inflorescence). Leaves 1-2 with 1-3 foliaceous bracts; blade 12-40 × 2-8 cm, leathery. Inflorescences to 50 cm; bracts 0.5-1.3 cm. Flowers yellow to yellow-orange or yellow-green with red-brown spots on all perianth parts; sepals 30-200 × 3-6 mm, apex acuminate-setaceous; petals shorter than sepals, 14-37 × 3-5 mm, apex acuminate; lip yellow to yellow-green with several large red-brown spots near lip callus, ovate-lanceolate, 14-27 × 8-14 mm, apex abruptly acuminate; callus of 2 pubescent lamellae, each with distal tooth; column yellow, 2 mm. Capsules 1-15 cm. Flowering winter--summer (Jan--Aug). Epiphytic in hammocks; 0[--1000] m; Fla.; Mexico; West Indies; Central America; n South America. This widespread species is extremely variable in the dimensions of the sepals and petals. 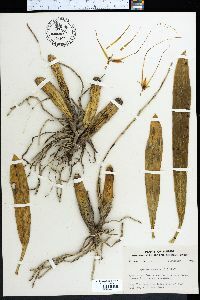 Plants in collections from Florida are generally smaller than those from other parts of the range.